It can be a challenge to entertain your pup when there is a blizzard or a downpour outside. Thankfully, there are fun games you can play indoors that will not only entertain your furry friend, but help train her as well! Keep reading to learn how to prevent cabin fever and entertain your dog indoors. Tracking is one of the most natural abilities a dog possesses. This finding game is certainly entertaining, but it can also be extremely useful when you can’t find things like your car keys or wallet. Here is how to play! Start out with a dedicated object and place it a couple of paces away from your dog. Use a devoted phrase such as “Find my wallet” Or “Where are my keys?” and fill in the blank with the object you’ve selected. Lead your dog to the object of choice and reward her enthusiastically while you place the treat next to the object. Repeat this step for a few minutes periodically throughout the day and increase the distance between the object and your dog every couple of days. The goal is for your dog to associate your command with the requested object and eventually learn to use their nose to smell out the item. Spotting the object at first will help her learn. 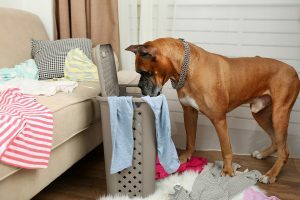 Once your dog understands what you’re asking of her, increase the difficulty by hiding the object in more challenging spaces. Somewhere that is still visible, such as nested against furniture legs, or in corners. When this is no longer a challenge for your dog, begin hiding it in other rooms, on top of furniture, or in a pile of laundry. When the weather clears, take this training game outside! With a little determination and creativity, you and your pet will have plenty to keep you busy during the next bout of bad weather. 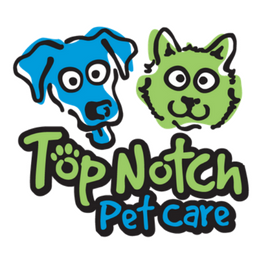 Give us a call if you’ll be away and your Top Notch Sitter will make sure even in bad weather your dog is entertained. Get pet tips, special offers, and our FREE ebook New to Corvallis with pets! Outfit your dog with a collar and ID tag that includes your name, address and phone number. An ID tag greatly increases the chance your pet will be returned home safely and quickly if lost. The collar should not be tight; two fingers should easily slip underneath it. Have your dog microchipped. Even if the collar or tag come off, a Microchip ID can help assist in your dog's safe return home. Get instant alerts on pet food recalls! Providing Top Notch Pet Care When You Can't Be There Since 2012!